There are no current plans for any live dates. Any confirmed live concert dates will be announced first on the front page of the Website. 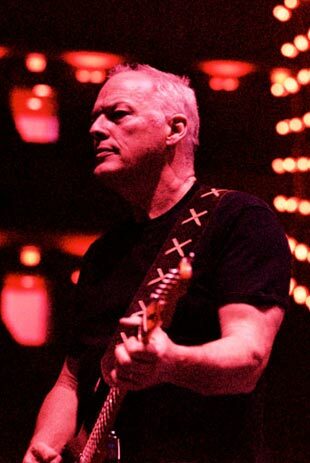 Subscribe to the David Gilmour Mailing List on the Contact page for relevant e-mails about important events. Having contributed some guitar to The Levels, a track from Ben Watt's new album Hendra, David went a step further and played on three songs in Ben's much-anticipated show at Islington's Assembly Hall, London. David was invited to appear at the last performance at Earls Court by stepping out for two songs with Bombay Bicycle Club. He joined them on lap steel guitar for Rinse Me Down and then took to acoustic guitar and vocals for Wish You Were Here. Douglas Adams, the much-missed creator of The Hitchhiker's Guide To The Galaxy, would have been 60 years old today, and his birthday was marked by a lengthy comedy and music gala. David joined the musical lineup, which included the musicians Adams described as his 'dream band'. David had agreed to play Comfortably Numb on one of Roger's performances of The Wall, and a capacity audience saw David appear atop the wall, recreating his parts from the classic album while adding his own unique sound and style, to the delight of the crowd. David Gilmour and Roger Waters reunited at HOPING's fundraising event, Hoping for the Children of Palestine. They played To know Him Is To Love Him, Wish You Were Here, Comfortably Numb, and Another Brick in the Wall, Part 2. David's only official live performance was one of the 'hidden' Crisis gigs, where he collaborated with Mali superstar duo Amadou & Mariam.